Strain encoding (SENC) technique has been developed to measure regional myocardial strain . SENC is similar to stimulated-echo-acquisition-mode (STEAM) sequence , and therefore suffers from a loss of signal-to-noise ratio (SNR). Current implementations of SENC uses gradient echo imaging sequences, which are not the optimal pulse sequence to gain SNR. Balanced steady-state free-precession (SSFP) imaging is widely used in the clinical routine of myocardial imaging because of its intrinsically high SNR and excellent blood-tissue contrast [3, 4]. 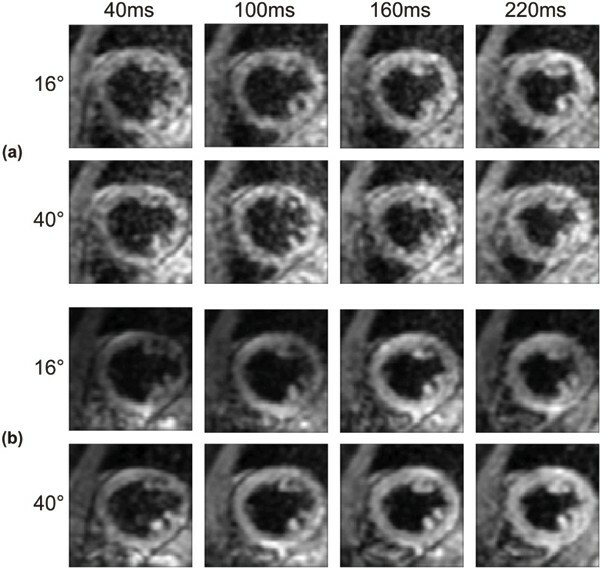 The combination of SENC with SSFP imaging could offer substantial improvement in the image SNR, and thereby enhances the qualitative and quantitative analysis of heart wall motion. In this work, a new technique (SENC-SSFP) is proposed for imaging and quantifying myocardial through-plane strain by combining SENC imaging with a fully balanced-SSFP pulse sequence. The SENC-SSFP sequence was tested in phantom and human experiments, and showed significant improvement in SNR compared to conventional SENC. The SENC sequence uses a tagging sequence to modulate the tissue magnetization with sinusoidal pattern. Deformations in the tissue will cause changes in the spatial frequency of the pattern, which can be detected by specific demodulation with tuning frequencies when imaging . In this work, the imaging part was replaced with SSFP acquisition, a schematic of which is shown in Fig. 1. To avoid disturbing the steady-state sequence, the preparation tagging pulses were inserted into the sequence using steady-state storage scheme . During acquisition, a gradient moment is added to the refocusing gradient in the through-plane direction in order to demodulate the acquired image by the required tuning frequencies. In order to maintain a constant SNR, we have used the ramped flip angle algorithm proposed in . SENC-SSFP was implemented on a 3 T Philips scanner. Numerical simulations of the Bloch equation were conducted using the ramped flip angle formulas for both the SPGR and SSFP pulse sequences. The SNR performances were evaluated and compared for different flip angles and heart rates. A phantom experiment was conducted using SENC and SENC-SSFP sequences. Each sequence was repeated for different simulated heart rates and different flip angles and the corresponding SNRs were measured. Two normal volunteers were consented and scanned using the same sequences. SNR was measured in the images by defining a region of interest in the myocardium where the signal was computed. The noise was measured from the background and adjusted for Rayleigh distribution. SENC-SSFP pulse sequence diagram. (a) Steady-state Storage scheme, (b) Tag preparation, and (c) Signal acquisition with the SENC tunings. The dotted lines illustrate the original values for the gradients while the solid lines show the actual used values for achieving the SENC tunings. Fig. 2 shows the simulation results for the ramped flip angle algorithms for both SPGR and SSFP. As shown, while the gain is nearly independent of the heart rate, it increases exponentially with the flip angle. However, due to the specific-absorption-rate (SAR) limitations, the flip angles can not be increased above certain values for actual scans. Fig. 3 shows the actual signal gain for the phantom and in-vivo studies. The figure shows that the SNR almost doubled for nominal flip angle values. Fig. 4 shows short-axis cardiac images acquired using the SPGR and SSFP for different flip angles. We can easily distinguish the SNR enhancement in both the myocardium and the background noise. Simulation results for the signal intensity in both SPGR and SSFP sequences for different last flip values and with a TFE factor = 6 and tr = 3.3 ms. (a) Relative signal intensity, and (b) Gain achieved for the SSFP over the SPGR. Experiment results for the SNR gain of SSFP over SPGR for different last flip angle values with a TFE factor = 6 and tr = 3.3 ms. (a) Gain in Phantom Study for different simulated heart rate, and (b) Gain for the in vivo studies with bars represent the =/- two standard deviation from the main value of the gain. Short-axis images for cardiac phases during early systole at location corresponding to left ventricular basal section and at two different flip angles using (a) SPGR, and (b) SSFP. For each image, the acquisition time, measured directly after the R wave, appears above its column, and the used flip angle appears to the left of its row. 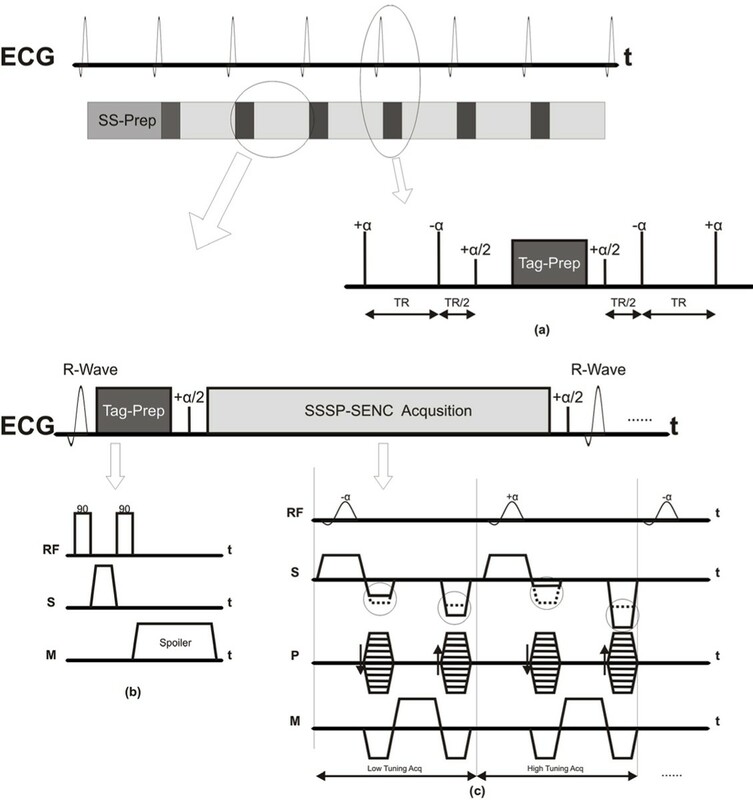 The combination of the SENC technique with balanced SSFP pulse sequence allows for high SNR cardiac functional imaging, which in turn is likely to improve strain quantification. This work was supported in part by grants from the national institute of heart, lung and blood R01HL072704, R01HL61912, and Donald W. Reynolds Foundation grant.